208 Queen Atlantic, made by the Portland Stove Foundry in Portland, Maine. 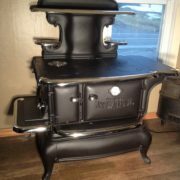 This stove was found locally for sale by someone whom had started restoration and realized what a task it was going to be. 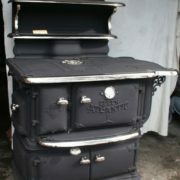 After starting the undertaking, we made a deal to sell it knowing that it would be fully restored. 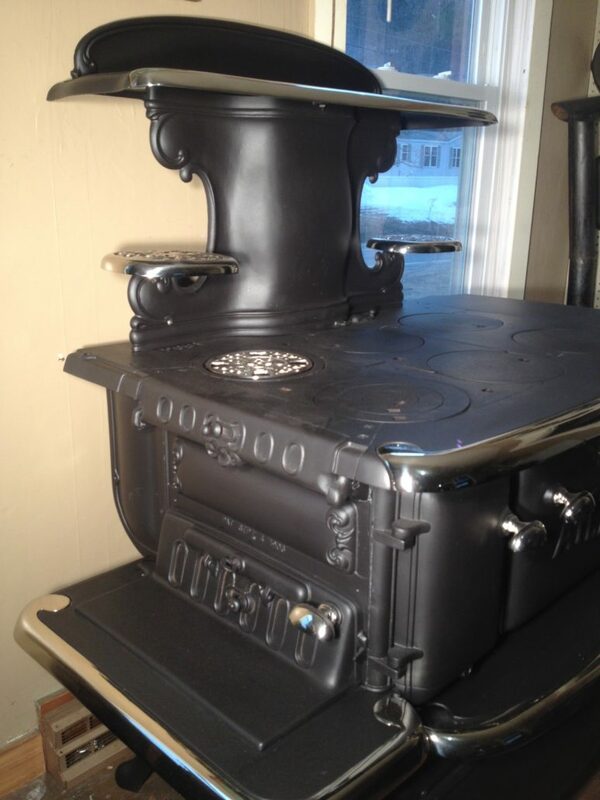 This Portland Foundry stove has a triveted mantel with shelf, is painted black with a nickel plated trim pieces and the signature Atlantic nickel plated trivet on the cook surface. Restored with 24″ all cast iron firebox for those cold winters and an 18″ oven for baking. Classic Beauty. Lattice mantle shelf, lattice in the side shelf and oven shelf. 24″ firebox and 20″ oven. What more would you ever want? 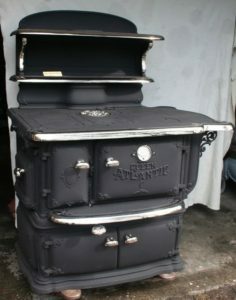 Portland Stove Foundry, Portland Me. Click thumbnail for large preview. 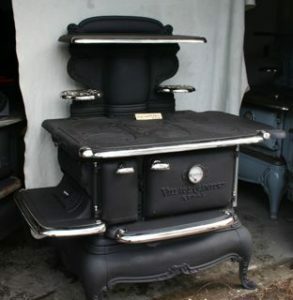 Sorry, this stove has been sold. Jim is working on another of the same model. 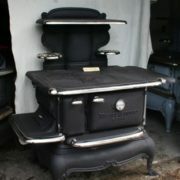 Please call Jim at 603-359-3475 if interested. 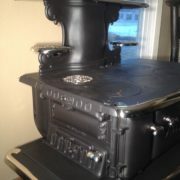 This is the Queen of stoves. Made by the Portland Stove Foundry in Portland Me., this cabinet style Queen Atlantic has a two door storage cabinet as its base, an extended fire box to hold a fire longer and a large two shelf back mantle. 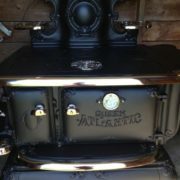 Lovingly restored by Jim. One of our favorites. 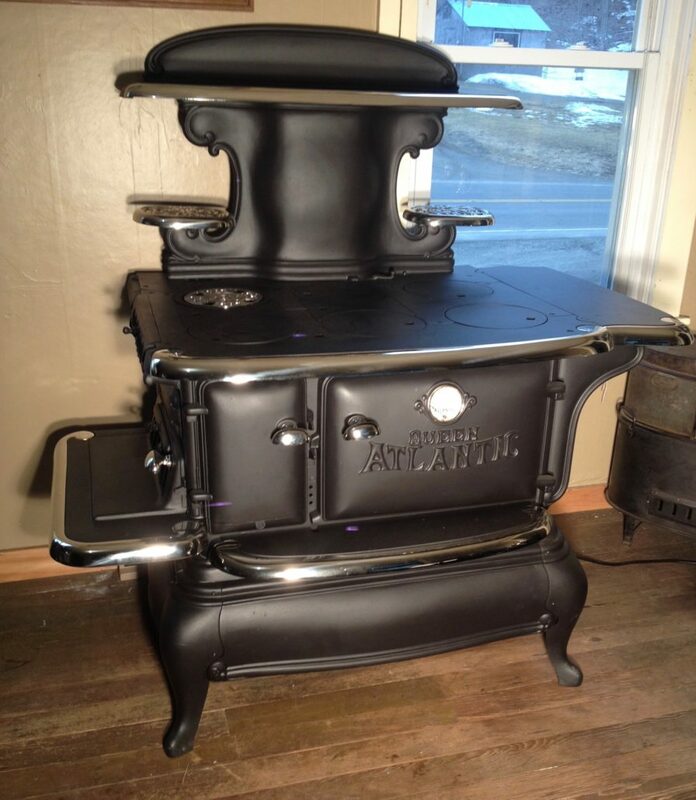 Overall dimensions 55″ H, 45″ W, 34″ D. Height to cooktop is 32 3/4″, cooktop is 35″ x 28″. 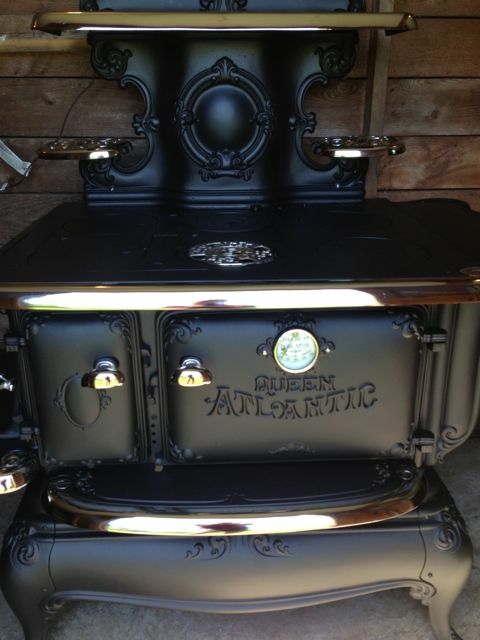 Oven is 18″ W, 19 1/2″ D, 11 1/2″ H. Firebox is 24″ L, 9 1/2″ W, 8 1/2″ D. Click thumbnail for large preview.